Click on any of the thumbnails to view a larger image on the source web site. Earlier this week we had occasion to make an unscheduled (and probably unauthorized) rear entry into a local medical complex. We have previously been through the regular front entrance (scheduled and authorized on all those occasions), and found the art on the walls not to our taste. Coming through from the rear we gasped at the sight of a wall full of Pettit posters. Living close to the some of the most awesome scenery in the Rocky Mountains, or anywhere come to that, we have become inured to the more tawdry representations of our local scenery. Even with the better class of artistic work, through time familiarity has soured to the stage of over exposure, breeding a certain passé disaffection. We are overstating our case, but only to make our point clear. Pettits, however, are in a class of their own. 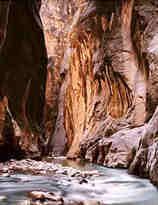 The three images featured here are (left to right) The Narrows, Antelope Canyon, and Angels Landing. Click on any thumbnail to see a larger version. 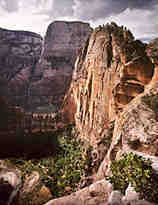 David Pettit is a local photographer, based in Springdale, the township just outside the south west entrance to Zion National Park on Utah State Route SR-9. At very reasonable prices you may buy from a choice of six posters, or make us insane with jealousy by buying an archival quality 30"x40" framed print of the East & West Temple. We were torn between that and the Angels Landing print, but the grayscale on silver halide material won, which probably makes us old fashioned. The process used for the color prints is LightJet 5000 hardware, printing onto Fuji Crystal Archive paper. You will not be disappointed in the detail, balance, depth and color saturation that can be achieved. We have a personal preference for this process over the much vaunted Giclée process: we think chemistry is still superior to squirting ink. Predictability is a great thing in printing. There are five note cards available, too, at very low cost. Not wanting to spoil your own exploration of this wonderful site by pointing out too many features, we simply recommend that you visit, and enjoy the glorious images that are displayed. Our caricature subject's birthday was celebrated yesterday. 'On April 29, 1974, the Film Society of Lincoln Center in New York sponsored a gala homage to [him] and his contributions to the cinema. Three hours of film excerpts were shown that night. François Truffaut who had published a book of interviews with [him] a few years earlier, was there that night to present 'two brilliant sequences: the clash of the symbols in the second version of The Man Who Knew Too Much, and the plane attack on Cary Grant in North by Northwest.' After the gala, Truffaut reflected again on what made [him] unique and concluded: "It was impossible not to see that the love scenes were filmed like murder scenes, and the murder scenes like love scenes… It occurred to me that in [his] cinema… to make love and to die are one and the same." Ceci n'est pas une petite mort, eh René? In our estimation the plane attack on Cary Grant in North by Northwest is the most irritating scene ever included in a movie: if threatened by a vehicle capable of moving at speeds many times greater than even the world's fastest sprinter, how long would you run directly ahead of its approach path before diving into nearby cover? We understand why this man is revered by many, but we have waited forty years to 'dis' (disrespect) that appalling scene in print! This entry was prepared using an IMDB (Internet Movie Database) feature. At least half the mystery novels published violate the law that the solution, once revealed, must seem to be inevitable. Today's picture by William Irvine comes from his photo gallery web site, called MacroNYC.com. William's digital eye takes a fresh look at the familiar New York City urbanscape, usually homing in on the parts that make up the whole. 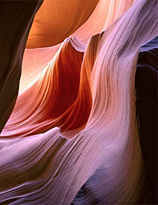 There are six beautifully presented galleries on the web site. Today we have featured the penultimate entry in gallery six. As you page through the galleries keep a lookout for our favorites: Wet Sphere, Door, and Canal Street 2. By profession William is a digital brand marketing guru, and he has a weblog called 'dBrand: The Digital Brand Marketing Blog' to share his expertise. We thought his well argued rejection of 'media convergence' was a refreshing change from all the trendy gobbledegook and jabberwocky that is peddled as the current reality. William, just remember what they did to Socrates when he enlightened them!